Dreaming of summer? We know your children and students are, too. But did you know that over the summer, students can lose three months of reading skills gained in school? This loss can make it harder to become strong readers by 4th grade. What can you do to make sure your child continues to learn throughout the summer? The Free Library has the answer for you! For Summer Camps, all you have to do is add at least 30 minutes of reading or literacy activities into the daily program for your campers heading to 1st-3rd grade in the fall. How can you do that? 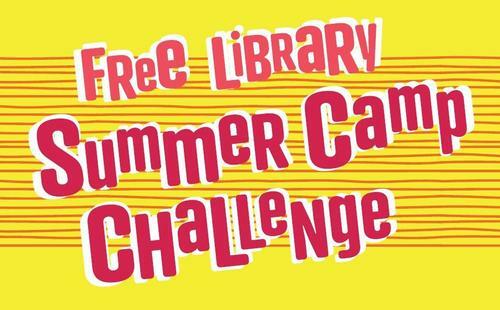 With the Free Library Summer Camp Challenge! We make it easy: when you sign up for the Summer Camp Challenge, you can choose a free Toolkit or purchase an Extended Resources or Special Collection Kit. You can pick the level of literacy resources that best fit your camp’s needs. All 2019 Toolkits include curriculum, resources, an activity tracker, and reading rewards for campers. Please check the Summer Camp Challenge registration for the different resources included in the Extended Resources and Special Collection Kit. Take some time to look over the different options for each Toolkit before you register. What would best serve your camp? What do you think your staff would be excited to implement? Then, register your camp! Registration has been extended to Friday, April 19th. Need to find a summer camp for your child? Afterschool Activities Partnerships (ASAP) Directory is a fantastic resource to find the right camp. You can search by activity type, language used at camp, ages served, Child Care Subsidy eligibility, and if transportation is provided. You can also search for afterschool programs during the school year. Make sure to ask potential camps if they’re participating in the Summer Camp Challenge! In addition to providing literacy activities for camps, every Free Library of Philadelphia location will host the Summer of Wonder game and extensive summer programming. More details about all of the library’s summer program offerings will be available soon. If you are a parent looking for strategies to incorporate literacy at home this summer, be sure to use the Read by 4th Guide to Summer Reading. It includes strategies, tips, and literacy game ideas that you can implement at home. Whether you are a camp provider or parent, you can make sure that your child has the tools needed to build literacy skills this summer with the Free Library! Add a Comment to Preparing for Summer with the Summer Camp Challenge!